Ginkgolide B, Spinal cord injury, STAT1, Mechanism. Spinal cord injury is a common form of trauma in clinic, which is mainly caused by the initial injury and secondary injury [1,2]. The initial injury usually appears passively in a short time, leading to irreversible neurological damage. In addition to the initial injury, the spinal cord injury part may further appear a series of secondary pathological changes, including tissue ischemia, edema, lactic acid accumulation, electrolyte changes, inflammatory state changes, free radical changes, disorder of energy metabolism, and cell apoptosis [1,2]. Current study suggested that spinal cord cell apoptosis is one of the main mechanisms of spinal cord injury [3-5]. It was considered that apoptosis related signaling pathway plays an important role in spinal cord injury . It was found that multiple signaling pathways involved in the process of spinal cord injury, including PI3K/Akt pathway, MAPK pathway, JAK/STAT signaling pathway, and so on. JAK/STAT1 pathway could be activated by extracellular cytokines and growth factors, so as to affect cell proliferation, differentiation, apoptosis, and immune regulation [7,8]. Some scholars revealed that JAK2/STAT3 signaling pathway plays an important role in neuron apoptosis model [9,10]. JAK2 and JAK3 were found in non-phosphorylation status in normal spinal cord tissue. Ginkgolide B is a kind of lipid material extracted from ginkgo biloba that plays a protective effect to cerebral hemorrhage caused by neuron injury through inhibiting nitric oxide synthase system . Clinical research showed that ginkgolide B had a protective effect for Alzheimer’s disease and other cognitive impairment diseases. Moreover, It was confirmed in vitro that ginkgolide B can protect spinal cord neurons through suppressing cPLA2 activation [12-14]. In this study, we constructed rat spinal cord injury model and applied ginkgolide B treatment, aiming to explore the molecular mechanism of ginkgolide B neural protection. Experimental animals: Male SD rats weighted 230-260 g were applied for experiment. All the rats were purchased from Shandong University. Rats were used for all experiments, and all procedures were approved by the Animal Ethics Committee of Jining No.1 People’s Hospital. DMEM medium, penicillin-streptomycin, and fetal calf serum were from Gibco. Mouse anti human Bcl-2, Bax, and p-STAT1 monoclonal antibodies and rabbit anti mouse secondary antibody were from ZSbio. Benchtop was from Formal. Inverted microscope was from Olympus. Incubator was from Thermo. CO2 incubator was from SANYO. Low temperature high speed centrifuge was from Beckman. -80°C refrigerator was from SANYO. The rats were randomly divided into sham operation group, spinal cord injury group, and ginkgolide B group. There were 48 rats in each group that were randomly divided into different time point subgroups (12 h, 24 h, and 72 h). Acute spinal cord injury model construction and ginkgolide B treatment: After anesthesia, the rat was incised on back midline. T10 spinous process was treated as the central, and the spinous process and spinous layer of T9-T11 were also exposed [15,16]. At 30 min after surgery, the rats in ginkgolide B group received ginkgolide B intraperitoneal injection at 4 mg/kg daily for 14 continuous days. The rat was anesthetized at different time points to open the thorax. Left ventricular and aorta were perfused by normal saline. T10 segment was collected and fixed by 4% paraformaldehyde for paraffin section. The left spinal tissue was stored in liquid nitrogen. The spinal tissue was dewaxed by xylene and dehydrated by ethanol. After washed by distilled water, the tissue was stained by hematoxylin for 10 min. Next, the tissue was immersed in 1% ethanol for layering. Then the slice was incubated in alkaline phosphatase solution for staining. After washed by distilled water, the slice was stained by eosin for 5-10 min. At last, after dehydration, hyalinization, and sealing, the slice was observed under microscope. The slice was stained by TUNEL reagent according to the manual (Beyotime). Under the microscope, 4-6 visual fields were randomly selected for cell counting. Apoptotic index=(TUNEL positive cell/total cell) × 100%. Spinal tissue protein was separated by SDS-PAGE and transferred to PVDF membrane. After blocked by 5% skim milk, the membrane was incubated in phosphor-STAT1, Bcl-2, and Bax antibodies. Total STAT1 and GAPDH were selected as internal reference. The membrane was detected by chemiluminiscence and the image was disposed using Image J. Inclined plate test and Basso Beattie Bresnahan (BBB) score were adopted at 22:00 every day to evaluate spinal function [17,18]. For inclined plate test, the angle between inclined plate and horizontal plate was gradually increased until the rat can stay on plate for at least 5 s. The angle was defined as inclined plate angle. For BBB score, the rat walked in specific time point and the posterior limbs motion was observed. The rat posterior limbs motor nerve function was scored according to BBB. All the data analysis was performed on SPSS17.0 software. The data depicted as mean ± standard deviation. T test and ANOVA were applied for data comparison. P<0.05 was considered as statistical significance. It was showed that ginkgolide B obviously alleviated spinal cord induced cell apoptosis at 12 h, 24 h, and 72 h (Figure 1, P<0.05). Figure 1: Ginkgolide B suppressed spinal cell apoptosis. *P<0.05, compared with sham group. #P<0.05, compared with spinal cord injury group. Western blot results revealed that Bcl-2 significantly elevated in spinal cord injury group, while ginkgolide B treatment markedly downregulated its level after 72 h. Bax declined in spinal cord group, whereas obviously upregulated after ginkgolide B treatment (Figure 2, P<0.05). Figure 2: Ginkgolide B affected Bcl-2 and Bax expression. *P<0.05, compared with sham group. #P<0.05, compared with spinal cord injury group. We collected spinal tissue for section and HE staining. The results demonstrated that compared with spinal cord injury group, the cell number in spinal gray matter markedly elevated in ginkgolide B group at 12 h, 24 h, and 48 h (Figure 3, P<0.05). 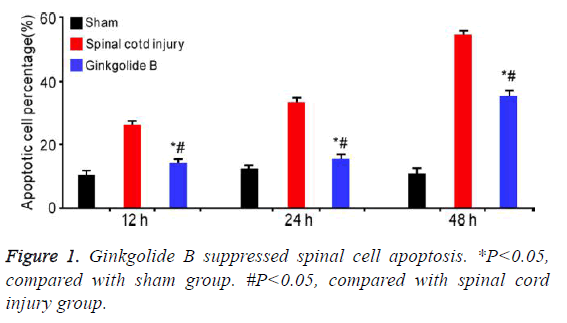 Figure 3: Ginkgolide B increased cell number in spinal gray matter after spinal cord injury. STAT1 phosphorylation significantly increased in spinal cord injury group compared with sham group. Ginkgolide B treatment obviously declined STAT1 phosphorylation at 12 h, 24 h, and 48 h (Figure 4, P<0.05). Figure 4: Ginkgolide B affected p-STAT1 expression. A: Quantification of p-STAT1 expression; B: Western blot analysis of p- STAT1 expression. *P<0.05, compared with spinal cord injury group. #P<0.05, compared with spinal cord injury group. Inclined plate test and BBB score were applied to evaluate neural functional recovery at different time points. Inclined plate angle and BBB score gradually increased in ginkgolide B group following time extension (Figure 5, P<0.05). Figure 5: Ginkgolide B improved neural functional recovery. A) Inclined plate test. B) BBB score. *P<0.05, compared with spinal cord injury group. #P<0.05, compared with spinal cord injury group. In this study, we successfully established rat spinal cord injury model and used the ginkgolide B for treatment. Our results indicated that ginkgolide B can inhibit cell apoptosis in spinal cord tissue and improve the phenotype of spinal cord injury. On the molecular level, we observed that STAT1 phosphorylation involved in the improvement effect of ginkgolide B on spinal cord injury. In addition, we found that ginkgolide B may help neural functional recovery after spinal cord injury by inclined plate test and BBB score. In this study, we proposed that ginkgolide B protect spinal cord injury by influencing STAT1 phosphorylation. Bcl-2 family is mainly composed of anti-apoptotic genes Bcl-2, Bcl-XL, and Mcl-1, and pro-apoptosis gene Bax and Bik . Bcl-2 and Bax are the most representativeness among these genes, which plays apoptosis inhibition and promotion role, respectively. Current research suggested that the ratio of Bcl-2 and Bax may affect cell apoptosis. Its elevation inhibited cell apoptosis, while downregulation promoted cell apoptosis . In this study, our results showed that the ratio of Bcl-2 and Bax obviously decreased in spinal cord injury group, while it apparently upregulated after ginkgolide B treatment, suggesting that ginkgolide B played the curative and protective effect on spinal cord injury model through affecting the ratio of Bcl-2 and Bax. We further analyzed the protective effect of ginkgolide B on spinal cord injury phenotype. The results presented that cell number obviously increased in spinal cord injury after ginkgolide B treatment. We investigated the related signaling pathways based on this. Previous studies considered that JAK/ STAT signaling pathway may be involved in the protective effect of ginkgolide B on spinal cord injury . It was thought that STAT1 activation may affect cell apoptosis in pathologic state . Moreover, STAT1 could be found activated in neurons in the case of ischemic brain injury. Studies found that free radical scavenger and antioxidant can inhibit STAT1 phosphorylation to affect ischemic brain injury . In addition, the mouse with STAT1 defect showed alleviated symptom than wild type mouse in cerebral infarction model . Ginkgolide B is also thought to have antioxidant effect. Therefore, we tested STAT1 phosphorylation status and found that ginkgolide B treatment significantly downregulated STAT1 phosphorylation compared to spinal cord injury group, indicating that ginkgolide B played a protective effect through affecting STAT1 phosphorylation. Our investigation further found that ginkgolide B can improve neural functional recovery after spinal cord injury in long term by using inclined plate test and BBB score. To sum up, our results showed that ginkgolide B can improve spinal cord injury phenotype by inhibiting cell apoptosis in spinal cord tissue. 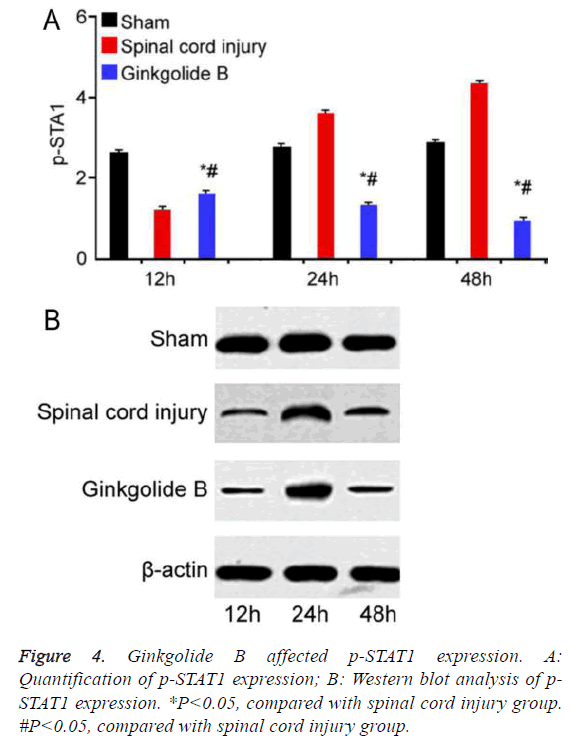 Ginkgolide B may protect spinal cord injury by affecting STAT1 phosphorylation. This work was supported by Yantai science and technology planning project (NO. 2016WS040). Rabai F, Sessions R, Seubert CN. Neurophysiological monitoring and spinal cord integrity. Best Pract Res Clin Anaesthesiol 2016; 30: 53-68. Rogers WK, Todd M. Acute spinal cord injury. Best Pract Res Clin Anaesthesiol 2016; 30: 27-39. Liu J, Han D, Wang Z, Xue M, Zhu L, Yan H, Zheng X, Guo Z, Wang H. Clinical analysis of the treatment of spinal cord injury with umbilical cord mesenchymal stem cells. Cytotherapy 2013; 15: 185-191. Vawda R, Fehlings MG. Mesenchymal cells in the treatment of spinal cord injury: current & future perspectives. Curr Stem Cell Res Ther 2013; 8: 25-38. Cox A, Varma A, Banik N. Recent advances in the pharmacologic treatment of spinal cord injury. Metab Brain Dis 2015; 30: 473-482. Zhao T, Qi Y, Li Y, Xu K. PI3 Kinase regulation of neural regeneration and muscle hypertrophy after spinal cord injury. Mol Biol Rep 2012; 39: 3541-3547. Bastien D, Lacroix S. Cytokine pathways regulating glial and leukocyte function after spinal cord and peripheral nerve injury. Exp Neurol 2014; 258: 62-77. Wang T, Yuan W, Liu Y, Zhang Y, Wang Z, Zhou X, Ning G, Zhang L, Yao L, Feng S, Kong X. The role of the JAK-STAT pathway in neural stem cells, neural progenitor cells and reactive astrocytes after spinal cord injury. Biomed Rep 2015; 3: 141-146. Hatiboglu MA, Kong LY, Wei J, Wang Y, McEnery KA, Fuller GN, Qiao W, Davies MA, Priebe W, Heimberger AB. The tumor microenvironment expression of p-STAT3 influences the efficacy of cyclophosphamide with WP1066 in murine melanoma models. Int J Cancer 2012; 131: 8-17. Kong LY, Abou-Ghazal MK, Wei J, Chakraborty A, Sun W, Qiao W, Fuller GN, Fokt I, Grimm EA, Schmittling RJ, Archer GE, Sampson JH, Priebe W, Heimberger AB. A novel inhibitor of signal transducers and activators of transcription 3 activation is efficacious against established central nervous system melanoma and inhibits regulatory T cells. Clin Cancer Res 2008; 14: 5759-5768. Calapai G, Crupi A, Firenzuoli F, Marciano MC, Squadrito F, Inferrera G, Parisi A, Rizzo A, Crisafulli C, Fiore A, Caputi AP. Neuroprotective effects of Ginkgo biloba extract in brain ischemia are mediated by inhibition of nitric oxide synthesis. Life Sci 2000; 67: 2673-2683. Wang GX, Cao FL, Chen J. Progress in researches on the pharmaceutical mechanism and clinical application of Ginkgo Biloba extract on various kinds of diseases. Chin J Integr Med 2006; 12: 234-239. Tchantchou F, Xu Y, Wu Y, Christen Y, Luo Y. EGb 761 enhances adult hippocampal neurogenesis and phosphorylation of CREB in transgenic mouse model of Alzheimer's disease. FASEB J 2007; 21: 2400-2408. Zhao Z, Liu N, Huang J, Lu PH, Xu XM. Inhibition of cPLA2 activation by Ginkgo biloba extract protects spinal cord neurons from glutamate excitotoxicity and oxidative stress-induced cell death. J Neurochem 2011; 116: 1057-1065. Sribnick EA, Samantaray S, Das A, Smith J, Matzelle DD, Ray SK, Banik NL. Postinjury estrogen treatment of chronic spinal cord injury improves locomotor function in rats. J Neurosci Res 2010; 88: 1738-1750. Perot PL Jr, Lee WA, Hsu CY, Hogan EL, Cox RD, Gross AJ. Therapeutic model for experimental spinal cord injury in the rat: I. Mortality and motor deficit. Cent Nerv Syst Trauma 1987; 4: 149-159. Rivlin AS, Tator CH. Objective clinical assessment of motor function after experimental spinal cord injury in the rat. J Neurosurg 1977;47: 577-581. Basso DM, Beattie MS, Bresnahan JC, Anderson DK, Faden AI, Gruner JA, Holford TR, Hsu CY, Noble LJ, Nockels R, Perot PL, Salzman SK, Young W. MASCIS evaluation of open field locomotor scores: effects of experience and teamwork on reliability: Multicenter Animal Spinal Cord Injury Study. J Neurotrauma 1996; 13: 343-359. Ola MS, Nawaz M, Ahsan H. Role of Bcl-2 family proteins and caspases in the regulation of apoptosis. Mol Cell Biochem 2011; 351: 41-58. Novakovic J, Mardesic-Brakus S, Vukojevic K, Saraga-Babic M. Developmental patterns of Ki-67, bcl-2 and caspase-3 proteins expression in the human upper jaw. Acta Histochem 2011; 113: 519-526. Song Y, Zeng Z, Jin C, Zhang J, Ding B, Zhang F. Protective effect of ginkgolide B against acute spinal cord injury in rats and its correlation with the Jak/STAT signaling pathway. Neurochem Res 2013; 38: 610-619. Frias MA, Montessuit C2. JAK-STAT signaling and myocardial glucose metabolism. JAKSTAT 2013; 2: e26458. Nash KM, Shah ZA. Current Perspectives on the Beneficial Role of Ginkgo biloba in Neurological and Cerebrovascular Disorders. Integr Med Insights 2015; 10: 1-9. Takagi Y, Harada J, Chiarugi A, Moskowitz MA. STAT1 is activated in neurons after ischemia and contributes to ischemic brain injury. J Cereb Blood Flow Metab 2002; 22: 1311-1318.